This product requires an affidavit before purchase. Please download the form, fill it out, then send it to us via fax (928-537-0893) or email (sales@factor2.com). 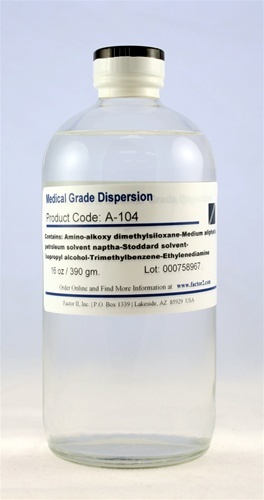 A-104 Fluid 50% Medical Grade Dispersion is a liquid RTV solution containing 50% active silicone ingredients in mixed aliphatic and isopropanol solvents. The active silicone used is an aminofunctional dimethylsiloxane copolymer. The polar nature of the aminofunctional groups and the ability of the fluid to cure cause films to deposit and adhere to metal cutting edge. Type: 50% silicone dispersion in aliphatic and isopropanol solvents. Special Properties: Excellent lubricity; high adhesion to metal; easy application; room temperature cure.